Please add updates there as well! All straight lines of a HelpLayer are infinite in length. 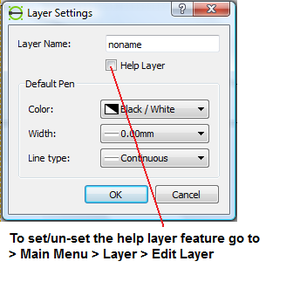 To set/unset the help layer flag of a layer, use the layer edit dialog (Main Menu: Layer -> Edit Layer), or the printer icon before the layer name in layer widget showing the list of layers. The lessons are in PDF format and because they are to big for the Wiki, please find them in Harry's Box.com area. This page was last modified on 11 November 2014, at 21:46. This page has been accessed 45,852 times.